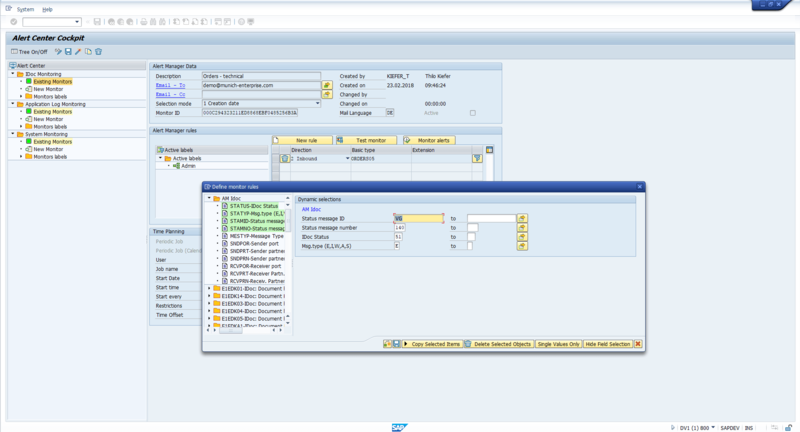 SAP IDoc Monitoring – you do not want to waste valuable time to monitor electronic business transactions? SAP IDoc Monitoring can be improved with our add-on IDocMonitor for your ERP system for monitoring, processing and administration of intermediate documents (IDocs). Because these IDocs are the central format for data exchange with internal and external systems in an SAP system environment. On the one hand, data from the application documents and master data is written to IDocs during outbound processing. Afterwards they will be sent to the target system. On the other hand, during inbound processing, IDocs are transferred from a source system to the input interface. Then they are stored in the SAP system. In a further step, the document data is generated and posted in the respective application. However, errors occur in the processing of IDocs in an ERP system. In practice, many companies spend valuable time identifying and correcting these errors. As a result, delays and disruptions to business processes occur. With the SAP IDoc Monitor, you always know whether the data transfers of your business transactions run without errors. Due to easily definable content and technical rules, these states are recognized immediately. If a previously defined situation occurs, the responsible employees will be informed automatically by e-mail. You can then correct the reported errors directly from the e-mail. You define the rules for a monitor to recognize certain situations and the distribution of messages according to your requirements. With the help of this timely error detection, you reduce the delay in your business processes with the IDocMonitor. What are the advantages of using the IDocMonitor? The timely detection, control and correction of the IDoc processing is an expensive, time-consuming activity in the standard. Thus, the IDoc control and monitoring burden the IT departments and the department alike. In many individual steps, error situations must be detected and analyzed. In order to meet these challenges when monitoring IDocs, we at mes have developed the IDocMonitor, an sap idoc monitoring report, as an add-on for ERP. Irrespective of whether they are IDocs for the exchange of business documents via EDI or IDocs for linking various business applications and systems. The bottom line is that you control your interfaces effortlessly with the IDocMonitor. Thus, the times for detection, analysis and processing of errors are significantly reduced. This saves your resources and speeds up your processes. How does the IDocMonitor work? With the IDocMonitor, you simply define technical and content monitors. These periodically check the system status by means of jobs in the background. As a result, faults are detected immediately and without any human resources and the correct measures are automatically initiated. You can easily differentiate between technical and content problems when processing the IDocs. Due to the special user interface, the required filter criteria for a monitor can be easily defined. Relevant business content or error and status codes are easy to identify. See a list of sap idocs status in our small sap idocs tutorial. Simplify and accelerate time-consuming routine activities with this tool. Your IT team or administrators will be relieved. You use the IDocMonitor to improve the monitoring and correction of defects. The distribution and ease-of-use mechanisms allow you to move activities from the IT base to the relevant department. The mes as a partner supports you. Which functions are available in the IDocMonitor? Would you like to know more about the functions of the IDocMonitor? Make an appointment now for a live demo. We are happy to introduce the product to you. What is included in the IDocMonitor solution for ERP? With the IDocMonitor 2018 you get a real “ready-to-run” solution. Because it is quickly installed and ready to use within a few days. Furthermore, you do not need any other components for software and services. Moreover, you define the set of rules with technical and content-related filter criteria quite simply without further special knowledge. In any case, you can easily add or change the so-called alerts after a brief briefing. As a result, you have a solution in no time to monitor and correct EDI data in a timely manner. With the help of this add-on, many companies across all industries are greatly simplified in monitoring their electronic business processes. This will improve and speed up your business and the exchange of data with business partners and partner systems. Convince yourself of the advantages of this application as part of a live product demo via web. Get in contact with us today. Would you like further information about our products and solutions? Just contact us. We look forward to you.